On August 29, 2005, Hurricane Katrina crashed a forty-foot tidal wave over the Marine Life Oceanarium in Gulfport, Mississippi. The dolphin house was demolished, and its inhabitants swept from their tank into the Gulf of Mexico. After growing up in captivity, how could the eight bottlenose dolphins feed and protect themselves in the wild? And if they could survive, would their trainers ever see them again? This fascinating picture book—enriched with both beautiful color-wash illustrations and photographs taken by the trainers themselves—tells this dramatic, happy-ending story. Janet is a talented nonfiction children's author. Her book, Secrets, Lies, Gizmos, and Spies: A History of Spies and Espionage (Abrams, 2006), was a 2007 ALA Best Books for Young Adults nominee, recipient of the National Parenting Publications 2006 gold award, and Scholastic book fairs took about 60,000 copies of the book. Her other recent non-fiction titles include Baseball for Everyone: Stories from the Great Game (Abrams, 2003), a Publishers Weekly Best Non-fiction Books of 2003 selection, and Famous Bears and Friends (Dutton, 2002). She is the proud mother of two grown sons and lives in Wayland, Massachusetts. Half-French, half-Italian, the late Yan Nascimbeneshared his childhood between these two countries. After working as a photographer's assistant in a Paris fashion studio, Nascimbene studied at the School of Visual Arts in New York and at the University of California at Davis. Nascimbene's illustrations have appeared in numerous publications worldwide, including Time, Newsweek, The Wall Street Journal,Chicago Tribune, the New Yorker, Boston Globe, Toronto Life, ScientificAmerican, Atlantic Monthly, Hemispheres, etc. His commercial clients include Air France, British Airways, Continental Airlines, IBM, Apple, Macy's, Stanford University, UC Berkeley, Bank of America, United Way, Estée Lauder, Manpower, and more. 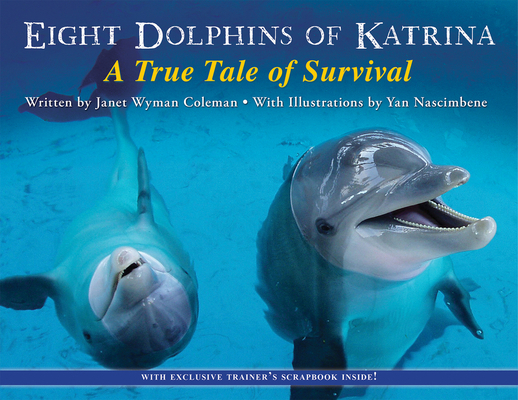 "Laced with dialogue that accentuates the trainers' affection for the dolphins and sense of urgency, Coleman's clipped narrative recounts the rescue of all eight. . . the late Nascimbene's dappled watercolors have a lovely silk-screened quality, contrasting the destructive force of the hurricane and the tranquility that arrives in its wake." "A spark of hope in the wake of a devastating natural disaster." "Animal lovers will empathize as they follow the trainers' worries and ultimate elation. A heartening, real-life rescue story."